What is great about “Dawn of the Planet of the Apes”? In a word, everything. But for this limited list we will stick with my ten favorite things about this summer’s most talked about film. You can read my official review here. SPOILER WARNING: Do not read any further until you have seen the film. And if you have not seen it, stop what you are doing and run to the nearest cinema immediately. It is a profound, deeply affecting, amazing, exciting movie—a true emotional experience. It was a very wise decision to have a key sequence of scenes set in Caesar’s old home—his human home in Pacific Heights—where he lived in a warm, nurturing environment with a loving human father (Will), grandfather (Charles), and surrogate mother (Caroline). Just being in that house and feeling the memories and ghosts of Caesar’s past was melancholy magic and a treat for fans. 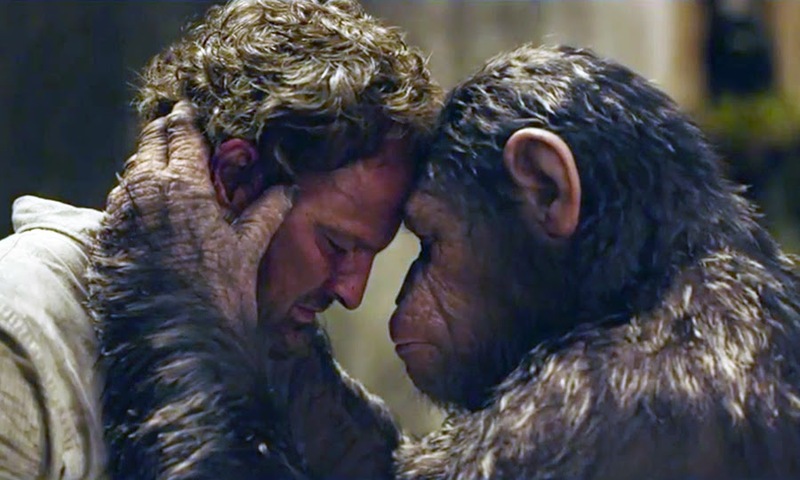 The trip down memory lane is also a reminder of why Caesar and Koba see humans so differently. While Caesar was playing chess with Charles, sitting down to family dinners, and going on picnics to Muir Woods—Koba was being tortured, experimented on, and locked up alone in a tiny steel cage. Which leads into number two on this list. Koba is a tragic—and great—character who plays a Shakespearian role in this epic ape opera. A word must be said here about the actor who plays Koba—Toby Kebbell. I said in my review of “Dawn” that Andy Serkis deserves a Best Actor Oscar nomination for his work as Caesar. I would add to that, Toby Kebbell gives a performance as Koba worthy of a Best Supporting Actor nod. He makes us feel Koba’s rage, his hurt, his pain—his thirst for vengeance that drives him into madness. 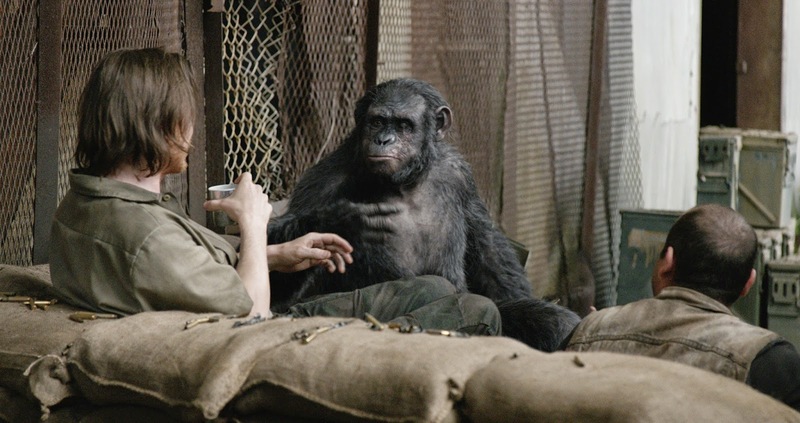 While is easy to hiss at Koba as one of the film’s chief villains, most of us would feel the same way as the brooding bonobo if we had suffered the lifetime of horrors he has endured at the hands of humans. 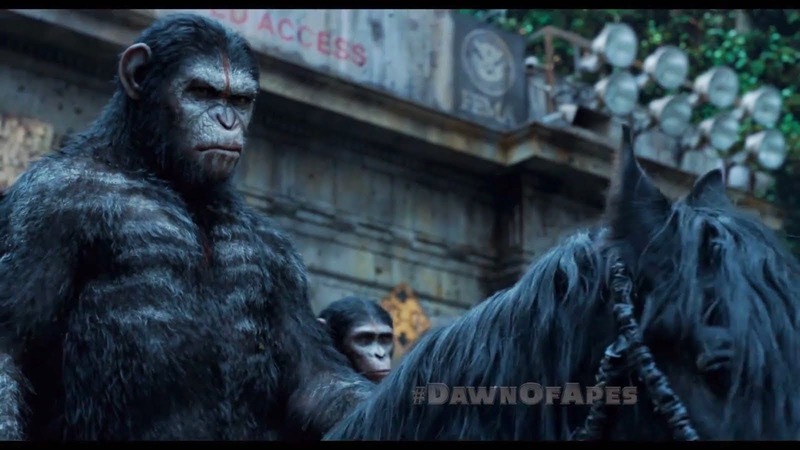 For more on Koba’s backstory read the outstanding “Dawn” prequel novel “Dawn of the Planet of the Apes: Firestorm” by Greg Keyes. The thing that really adds to the tragic depth of this character and story—Koba was right. If only he could have contained his hatred, stayed loyal to Caesar, went to scout the armory in an official capacity; then maybe, just maybe there could have been peace? Probably not. Dreyfus (Gary Oldman) and his gun fetishists would have launched a sneak attack on Ape City no matter what. And if not him, then someone else. After all—as Caesar says in the film—Koba learned hate from humans. 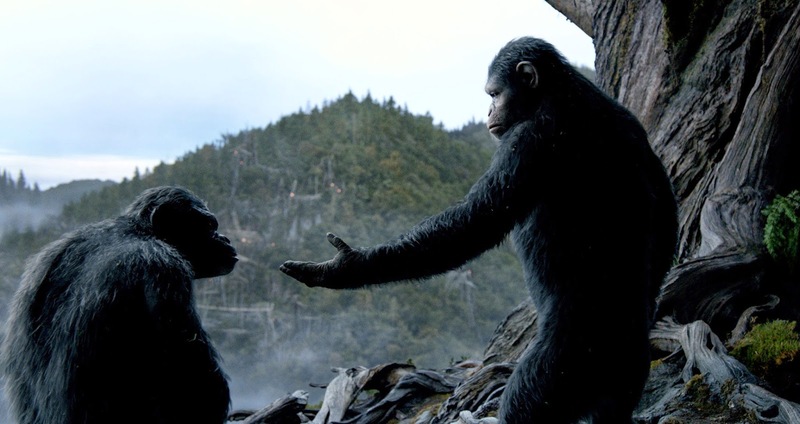 Koba betrayed Caesar, but may have saved the apes after all. 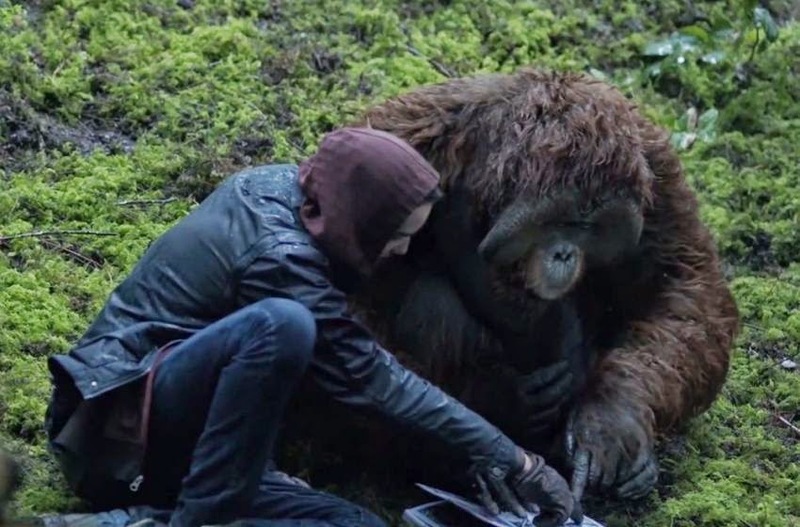 One of the many wonderful subplots in “Dawn” is the touching friendship that develops between Maurice the deep-thinking Orangutan statesman and Malcolm’s teenage son Alexander. The scene where the two of them sit side by side reading a book is pure movie magic. It is a reminder of what could be—what should be—when hate and fear and racism and bigotry are absent. If only the Carvers and Kobas and Dreyfuses of the world would stop standing in the way, think what could have been in the world of “Dawn”—and in our world. 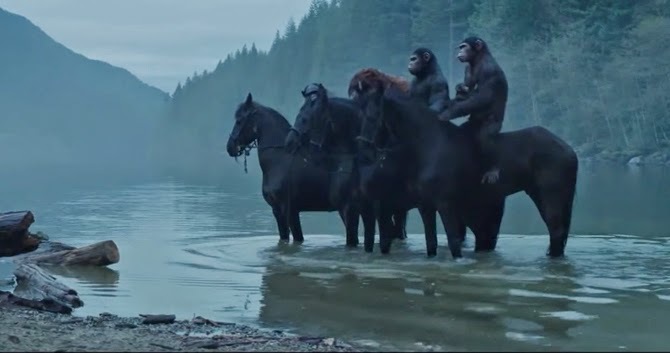 When Caesar marches his ape army into San Francisco on horseback and warns humans to “not come back”, it is a magnificent scene of epic imagery wielding such staggering, visceral power, it sends chills of spastic delight up and down the spine of any moviegoer with a pulse. Michael Giacchino’s outstanding score is one of his best and the action march he composed here is a delicious homage to Jerry Goldsmith’s “The Hunt” from the 1968 original. This jaw-dropping, intense, spectacular show piece of a scene is a masterwork of staging and presentation—one of many in this amazing movie. Talk about opening a movie big. This kinetic, rousing, thunderous action set piece of the apes engaged in an organized moose hunt seems modeled after and inspired by the fabled buffalo hunts of Native Americans (that is before the white people arrived and killed all the buffalo for, you know, fun). It also ties in beautifully to the heart-breaking opening scene of “Rise”, and of course the classic hunt scene from the 1968 film. This set piece is also a clever and effective way to introduce Caesar’s teenage son, “Blue Eyes”. To fully appreciate this scene one must read “Dawn of the Planet of the Apes: Firestorm”. Before he was tortured by humans at medical labs, Koba was forced to perform in a lame TV show for a cruel and abusive owner (the one who burned his eye out with a cigarette). I fully admit that I took great pleasure in watching Koba utilize this background to turn the tables on these two racist, gun-worshipping, idiotic, inbred morons. The entire design of Ape City/Ape Camp/Ape village and the stone-age culture they have built is an astounding artistic achievement in creativity and production design. The shot of Maurice teaching to a makeshift classroom of young (and easily distracted) apes is simply awesome—with attention to detail and nods to the original film series that fans will appreciate. Even before he was exposed to the ALZ-113 mist, Maurice was already highly intelligent and became Caesar’s intellectual consigliere. The scene where Caesar and Maurice sit on the mountain and talk about the old days is not only a delightful treat for fans of “Rise”, it is a clever tool to lay in some exposition about what has been going on the last ten years. A priceless scene with huge emotional and sentimental payoff for fans of “Rise”. This is the money shot seen in the trailer, many of the TV spots, and in one of the overseas posters. When Caesar is forced to say goodbye to Malcolm before the inevitable war begins, it is an emotional powerhouse—a moving, iconic moment that will be etched in cinematic history and our hearts forever. Again, the use of Michael Giacchino’s beautiful music really strikes the perfect note. If this scene did not get to you, then you probably are not reading this article.